Friday morning, I am dragging the Expert to Coach Monster’s spin class for the first time. I am looking forward to that more than the turkey. Today, I did an hour spin and a twenty minute swim. I hope to squeeze in three miles in the morning before the sun comes up. I love running in the dark. I know I post this all the time, but I am so grateful for my SBM friends. In fact, I am also grateful for you non-friend d-bags who persistently email me or comment stupid things – because even your ugly words make me a better person, so there. Y’all will get my super triathlon gratefulness blog post, full of tears and huge declarations, soon. But for now, all I can say is: I heart you. Just keep moving forward. Even if it’s with a gobble gobble wobble. Who's Going to Stop You? CPQ = Calm. Peace. Quiet. 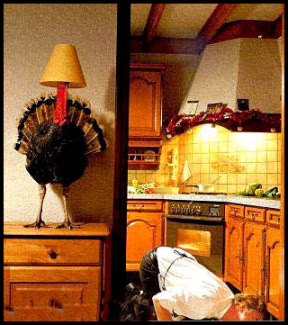 pps Happy Thanksgiving your side of the pond. Wow- that Expert rocks! Do you rent him out to give lessons? Ok – so I had this crazy idea the other day that I wanted to do a triathlon….it's nuts – I am so out of shape it's ridiculous. But I can't get the idea out of my mind. I just accidentally came across your blog – and now I'm even more inspired 🙂 Keep up the good work! I LOVE running in the dark. The best!